Let’s get straight to the point. I know that your foundation has SPF, but if you think that has got you covered, you are wrong. Sunscreen is your skin’s ultimate bae. But how can you wear it with makeup? Will it look too cakey? Or make your skin break out? How about reapplying it without taking your makeup off? When it comes to wearing sunscreen with makeup, there are too many questions and concerns. That’s exactly what I’m going to address in this article. Read on. Why Is SPF So Important? How Does It Work? Sunscreen Under Makeup: Does It Work? Isn’t The SPF In The Foundation Sufficient? SPF or Sun Protection Factor is a marker of how well your sunscreen can protect your skin from UV rays (UVA and UVB rays). UVA rays can penetrate deep into your skin and cause age spots, wrinkles, and hyperpigmentation, while UVB rays give you sunburn and even cause skin cancer. A sunscreen or sunblock that contains inorganic chemicals can deflect both UVA and UVB rays. Most dermatologists recommend a sunscreen lotion that has an SPF between 15 and 50. Anything that’s higher than 50 has not been proven to be more effective than SPF 50. A sunscreen that has SPF 15 can block 93% of UV rays, while one that has SPF 30 can block 97% of the UVB rays. In any case, some UV rays are still going to get through the sunscreen and reach your skin, so the SPF number is an indicator of how long it might take for your skin to turn red under the sun. In other words, a sunscreen with SPF 15 will prevent your skin from becoming red or getting tanned for about 15 times longer than usual. This means, if your skin starts burning in just 10 minutes, SPF 15 can prevent it for about 150 minutes (2.5 hours). So the big question remains – can you wear sunscreen under makeup? How does that work? Keep reading to find out the answers. Apply a moisturizer that has SPF. If you want your sunscreen to work under makeup, always buy a sunscreen that is specifically formulated for facial skin. These sunscreens are more lightweight than traditional sunscreens and will not make your skin look cakey. Also, if you are applying a facial sunscreen, make sure you use a primer on top of it. Zinc oxide and titanium dioxide work as physical sunblocks and reflect UV rays just the way white paint reflects light rays. They also don’t irritate your skin. It’s just like wearing a mask under your foundation. However, organic chemicals like avobenzone absorb the UV rays and break them down to release heat. You must be wondering, when your foundation already has SPF in it, why do you need an additional sunscreen? Keep scrolling to find out. You can’t trust your makeup to protect your skin from UV rays. Why? Because it comes off easily, which affects the coverage. Moreover, when you wear sunscreen under your makeup, it provides a better base for your makeup. After applying sunscreen and before applying makeup, wait for a few minutes. Let the sunscreen set before going ahead with your makeup. This should be the first step of your makeup routine every day. Apply sunscreen generously. Don’t skimp on it. Now, let’s check out the steps involved in applying sunscreen with your makeup. Before you start your makeup routine, you need to prep your skin for that extra protection. Apply sunscreen on your entire face and neck and massage well. Focus on areas such as your forehead, near the hairline, the sides of your cheeks, and your jawline. These areas get major sun exposure. Never start applying sunscreen from the middle of your face because that way, you tend to miss out on the major areas. Once you have applied a coat of sunscreen, reapply it on these areas. You can always skip this step if you want to. But in case you are applying makeup primer with sunscreen, you need to do it in the correct order. Any skin care product goes underneath the primer. So, you have to apply sunscreen first and then top it up with a primer. A multitasking tinted moisturizer with SPF is your savior if you have sensitive skin. You can always apply your heavy foundation with a lightweight formula, such as a BB cream. It is not very difficult to find a BB cream that matches your skin tone and has SPF in it. If you are not using a tinted moisturizer or a BB cream, apply foundation all over your face and neck. Blend well and follow it up with the other makeup products. A setting spray with SPF will keep your makeup intact and also add an extra layer of sun protection. You can also use the setting spray while blending your foundation or spray it all over your face and neck after applying your makeup. Now that you are done with your makeup, another concern that you need to address is how you will apply sunscreen over your makeup. Sunscreen needs to be reapplied every 2 to 3 hours (or whatever application time is mentioned on the bottle). But, wouldn’t that ruin your makeup? Well, I have got you covered! There are plenty of ways to apply sunscreen over your makeup without ruining it. Check them out! A powder sunscreen helps when you are in no mood to smudge or smear your makeup. Take some powder sunscreen on a big makeup brush and sweep it all over your face and neck. Sunscreen powders are mostly water-resistant and give you a picture-perfect makeup look. These powders can control facial oil and are good for humid days. Spray sunscreen is a convenient option, though it doesn’t give as much coverage as lotions and creams. You need to spray it generously to make sure the sunscreen has covered every inch of your face and neck. Do not touch your face until it dries. Another thing that you can use is a makeup setting spray with SPF. Spray it on your face and wait for it to dry. Top it with some loose powder. If you are someone who is not a fan of powders and creams because you worry too much about spillage, you can go for a compact powder. 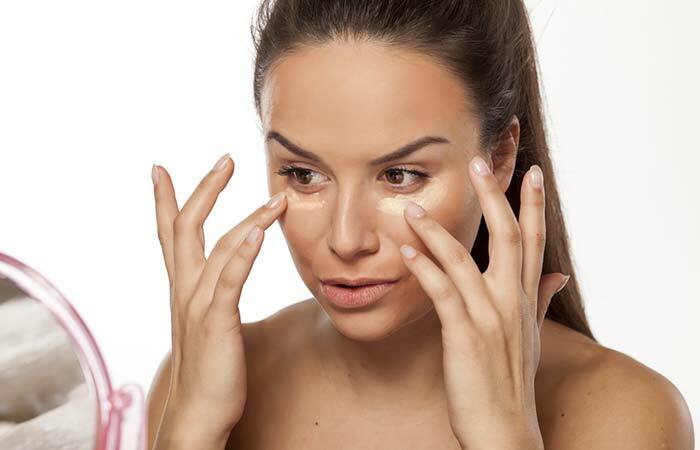 There are plenty of options available for compact powders with SPF. 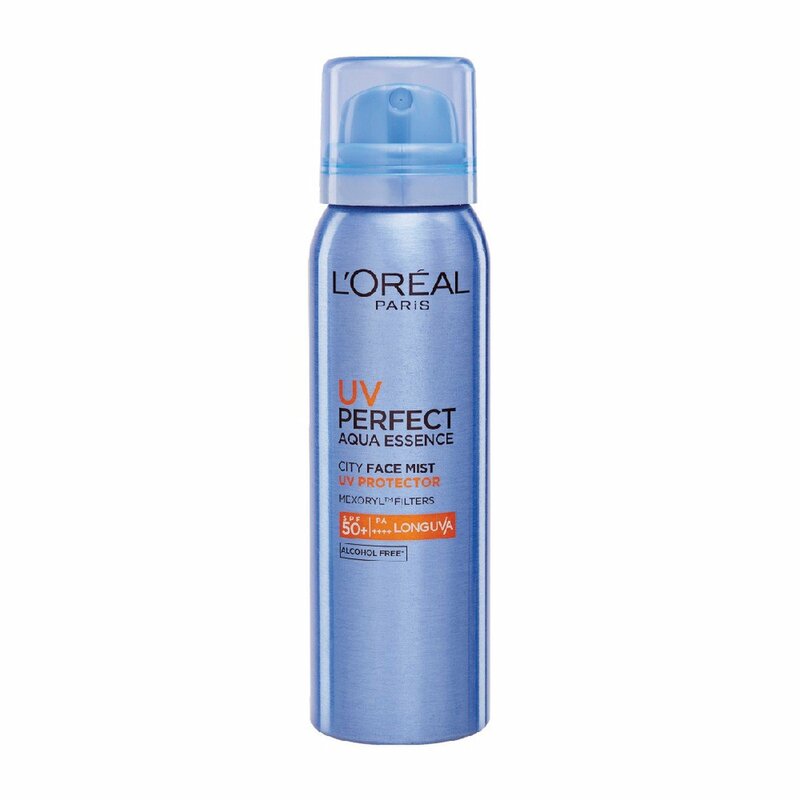 Always pick one that offers broad-spectrum sun protection and is water-resistant. 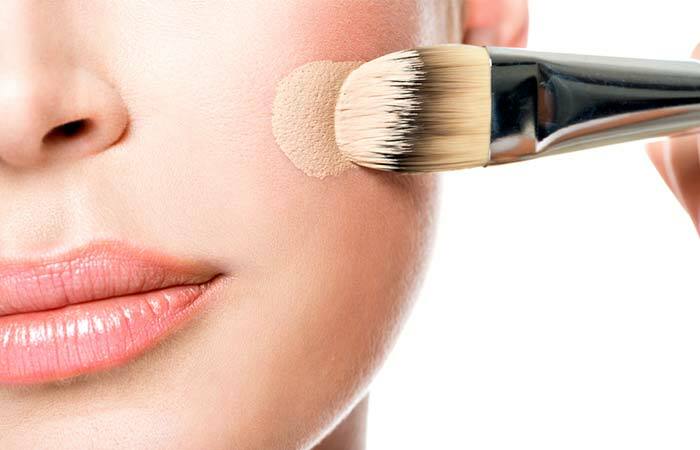 You can use a mineral foundation powder with SPF in case you are planning to stay outside for long. Mineral makeup powders can cover all areas of your face and neck evenly. 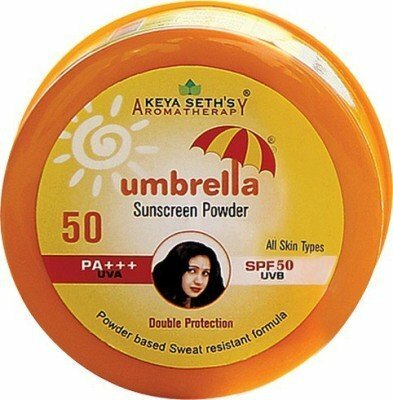 They help in reducing oiliness and boost sun protection. A translucent powder with SPF is easy to carry, and you can use it to touch up your face and neck anytime during the day. Compared to other types of powders, translucent powders are extremely light. Ideally, a sunscreen works the best when applied directly on your skin. But this is not feasible for women who are constantly on-the-go, unless you carry your entire beauty and makeup arsenal with you everywhere! If you are low maintenance and would prefer using just sunscreen throughout the day, we’ve got you covered. Here’s a list of the best sunscreens to wear with makeup. 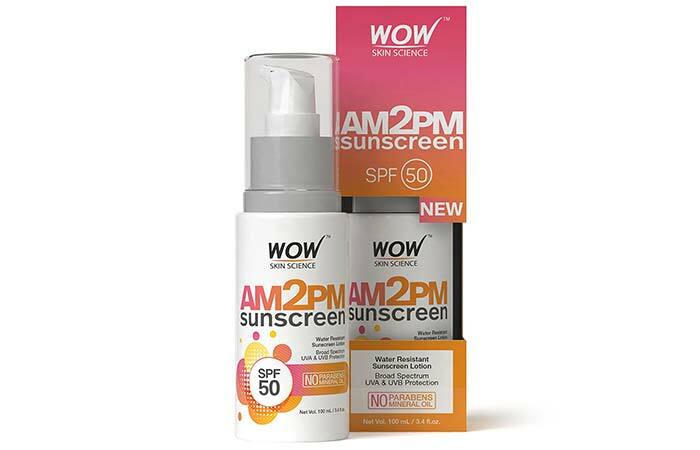 Wow Am2Pm Sunscreen has a non-greasy formula and is water-resistant. 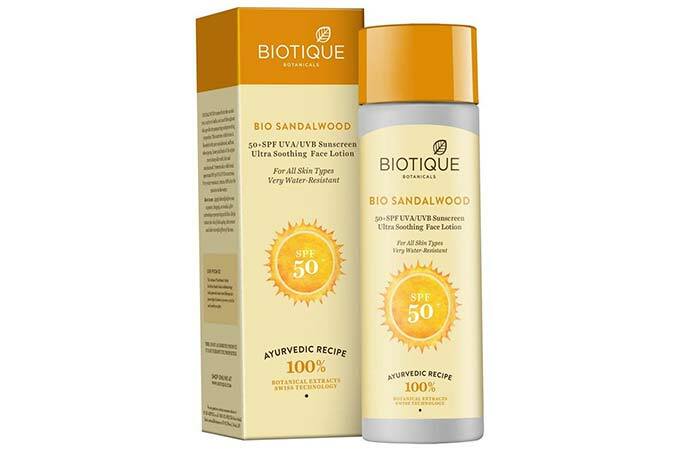 It provides you long-lasting sun protection even if you sweat profusely or go for a swim. It contains zinc oxide and titanium dioxide and is free of parabens and harmful mineral oils. 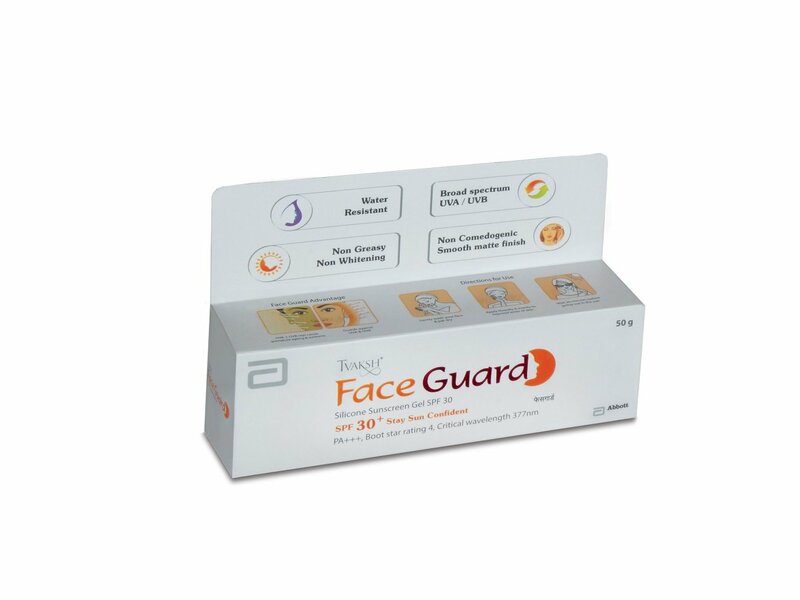 Face Guard provides both physical and chemical sun protection and has a broad spectrum of SPF 50. It gives you a matte finish and is best suited for oily and acne-prone skin. 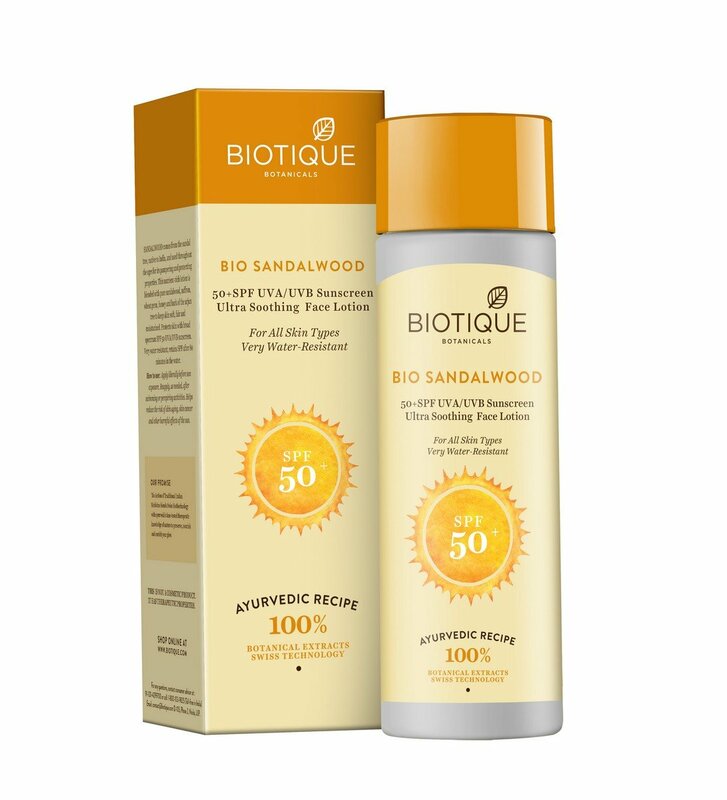 Bio Sandalwood Sunscreen is a water-resistant formula that contains natural ingredients and has a really wide SPF spectrum. It claims to retain its SPF even after you have spent 80 minutes in the water. It is suitable for all skin types. 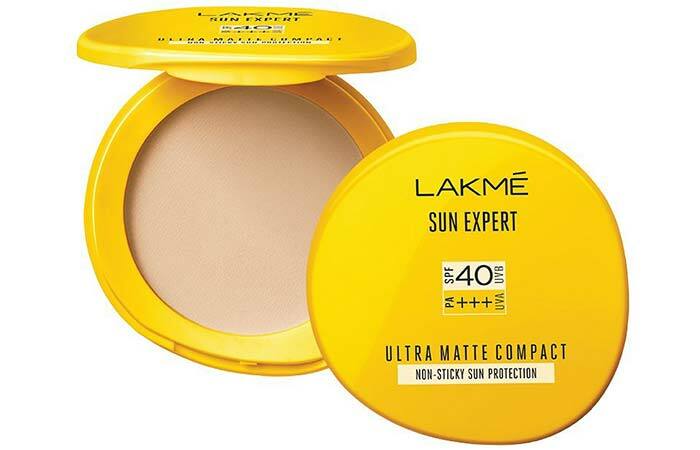 This powder is suited for retouching your sun protection layer when you are outside. 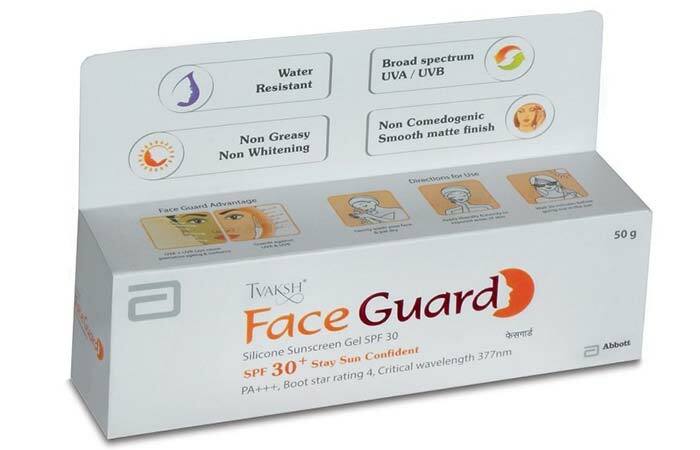 It offers wide spectrum sun protection and is easy to apply. 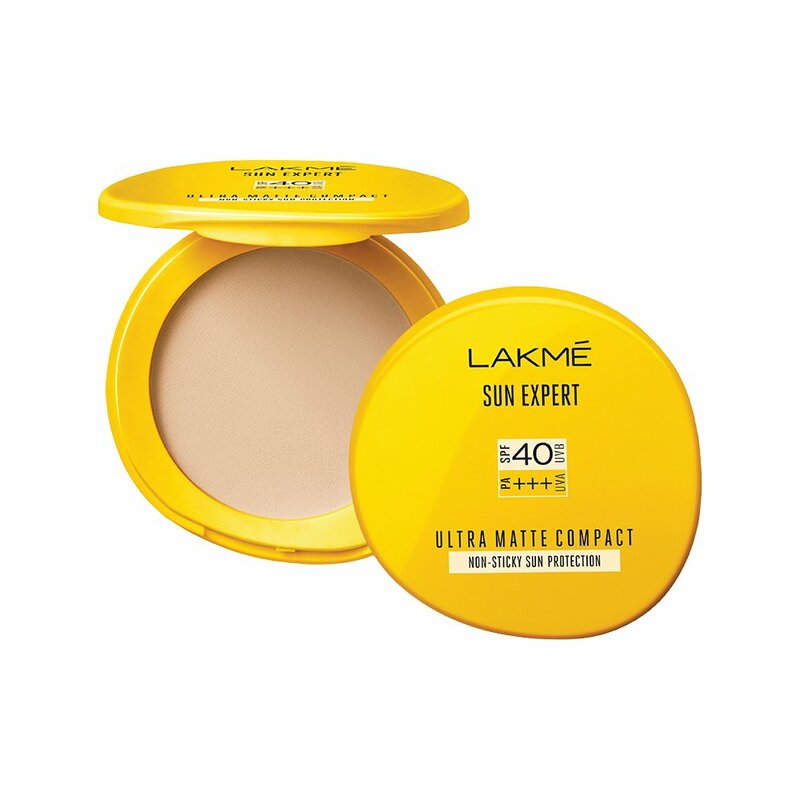 This compact is dermatologically tested and suitable for all skin types. It provides matte coverage, evens out your complexion, and is perfect for everyday use. This is the perfect product for anyone who wants to retouch their SPF protection and freshen up their makeup. This facial mist has a non-greasy formula that you can spray over your makeup. It comes with SPF 50 and is sweat-proof. 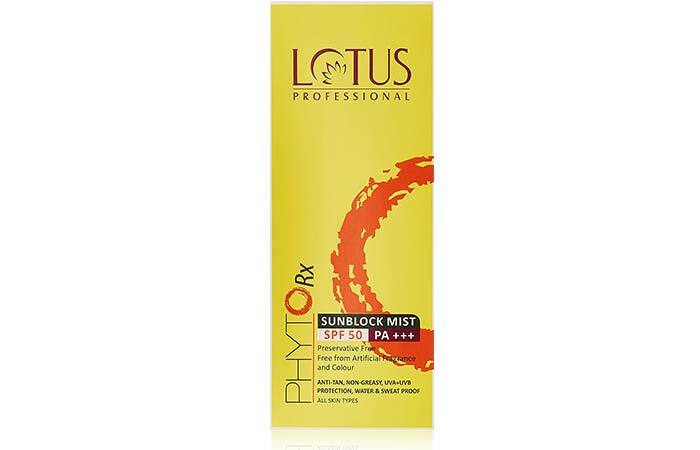 Lotus Phyto Rx Sunblock Mist helps in preventing sunburn and tanning. 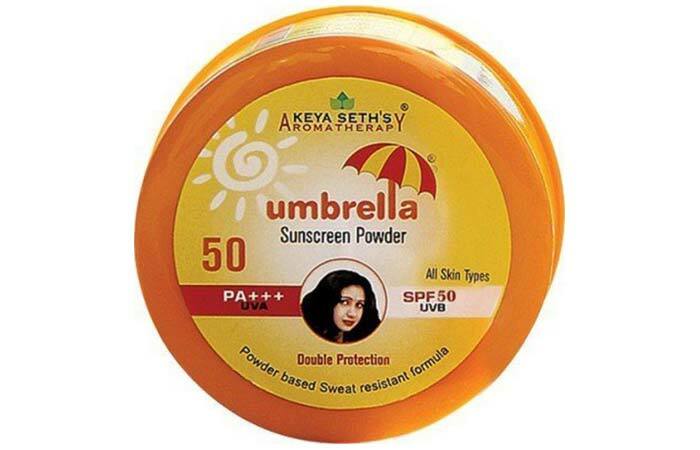 It has SPF 50 that provides broad-spectrum protection. It quickly gets absorbed into your skin and is waterproof and sweat-proof. Don’t take chances with your skin while stepping out! Sunscreen is not the ultimate solution, and I suggest you wear sunglasses, hats, and full-sleeved clothes to shield your skin from UV rays as much as possible. 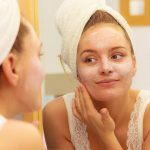 I hope that this article has helped you understand some ways to incorporate sun protection into your daily sunscreen and makeup routine. Drop your questions and feedback in the comments section below and keep following this space for more updates on skin care. 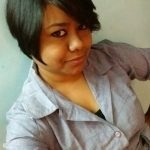 Sunblock vs Sunscreen – Which One To Choose?